Experience the excitement and competition of being a part of the United States Practical Shooting Association (USPSA). Practical shooting is an exciting, fun, fast action safe shooting sport where accuracy, power and speed count. USPSA courses of fire are predominantly “free-style” in nature where you are not told how to shoot the stage, just as long as you shoot it safely. 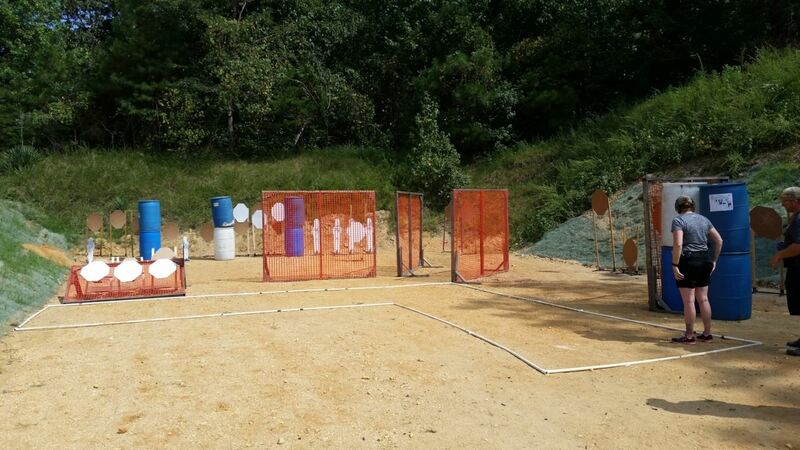 Courses of Fire have multiple targets, moving targets, reactive targets, penalty targets, partially covered targets, steel targets that are engaged all while moving and negotiating obstacles. There are six distinct divisions in USPSA that you can participate in based on what kind of pistol and equipment you want to use. If you own a pistol, holster, some magazines and a few magazine pouches, you can shoot in USPSA. Stages may consist of up to 32 shots. Typically two classifier stages are included in each SLSC club match. 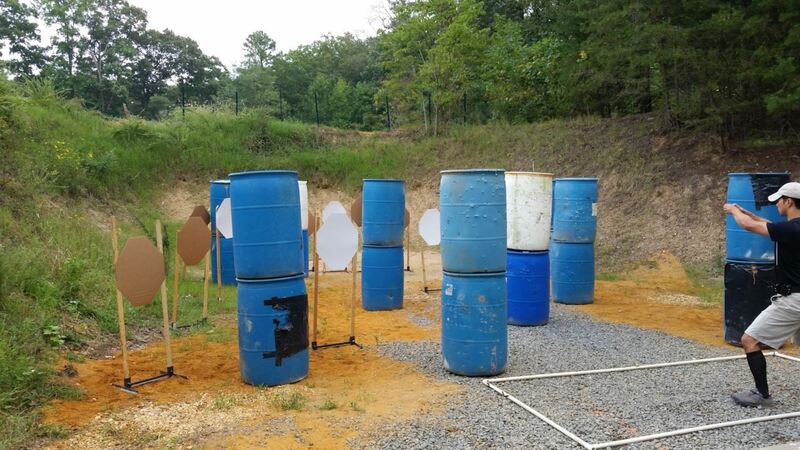 The Southern MD Practical Shooters is a USPSA affiliated club associated with SLSC and their website can be found here: Southern MD Practical Shooters and more information on USPSA is located at the USPSA website. Three shots on each paper target plus 6 steel for a total of 66 rounds! 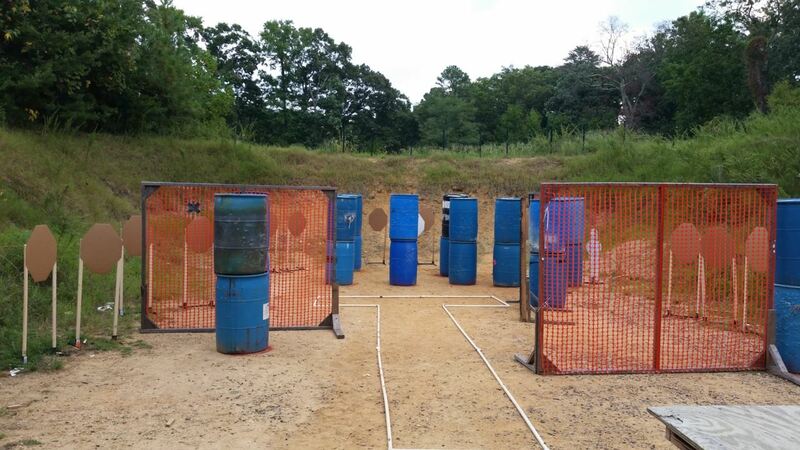 Eleven targets hidden among the barrels - 33 rounds! Eighteen paper targets and one steel - 55 rounds! A junior shooter enjoying the Monster Match. 5 to 6 challenging stages, 1 is a classifier unless otherwise scheduled. Open to the public to anyone who can legally possess a firearm. You do not have to be a member of USPSA to shoot local matches. Major matches (e.g. State Championship) require USPSA membership. See Appendix D of the rule book for specifics on each division. Ammo: You will need to bring 150 to 250 rounds. We have ammo restrictions to protect our shooters and steel targets. Ammo that has a velocity of 1600 FPS or Higher and Steel Jacketed Ammo i.e. Tulu or Wolf that has a copper washed steel jacket are prohibited. Stages are 12 to 32 rounds per stage. Various targets used are cardboard Classic or Metric, and the following steel targets US Popper, Mini Popper, Texas Star, Colt Speed Steel, and Steel Plates. “Comstock” – Unlimited time stops on the last shot, unlimited number of shots to be fired, stipulated number of hits per target to count for score. “Virginia Count” – Unlimited time stops on the last shot, limited number of shots to be fired, stipulated number of hits per target to count for score. “Fixed Time” – Limited time, limited number of shots to be fired, stipulated number of hits per target to count for score.